After our holiday to Kos last summer (feels like years ago now!) the other half and I got a bit addicted to the gorgeous Gyros Souvlaki we sampled while we were over there. Before we came home I picked up a few packets of the spice mix to make my own and only just got round to making it recently. You could have it without the mini roasties for 8sp but for an evening meal, this addition makes to whole thing lovely and filling. I use pork shoulder as I think it takes on the spices a bit better but you could use pork steaks either. Take your sliced pork shoulder, sprinkle over and rub in your spice mix with a little salt and pepper and leave to marinate for a few hours. I usually do this before work but I’ve left it for just 15 minutes before and it worked just as well. Par boil your new potatoes for around 7 minutes in a little salted water. Drain, pop into a baking tray and cover with paprika, oregano and salt. Toss together, spray with low kal spray and pop in the oven for 35-45 minutes on 180c (until golden and crispy). While the potatoes are in the oven you can prepare everything else. Prepare you salad bits and assemble on a board. I usually serve these in the middle of the table to let people stuff their own gyros. On your board you should have a big pile of shredded iceberg lettuce, sliced red onion and cherry tomatoes. Next make your tzatziki. Pop the greek yogurt and mint sauce into a bowl and mix. Once you have grated your cucumber you can try and squeeze some of the water out of it if you have time, if not add straight to the tzatziki. Add a little squirt of lemon and pop the bowl into the middle of your salad bits. Next take a griddle pan, spray with low kal spray and cook fry your pork on a medium heat until cooked through (usually takes around 10-12 minutes depending on your hob). Pop your pittas into the oven for the last few minutes of your pork cooking. 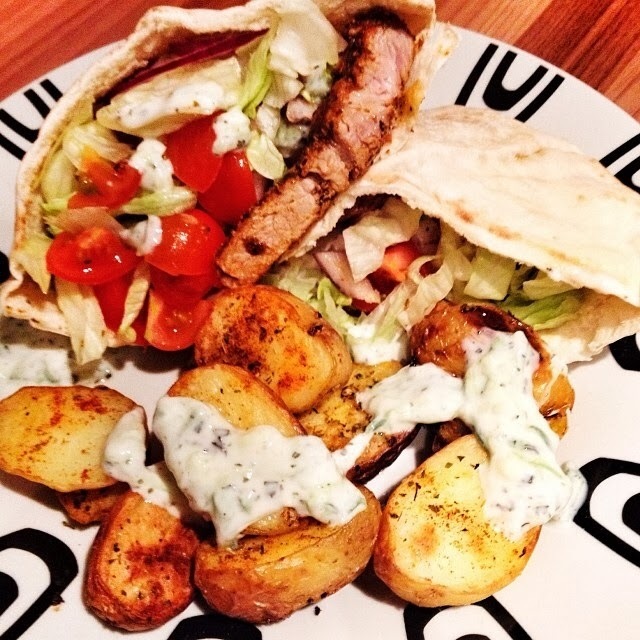 To assemble, open up your pitta pocket stuff with salad and pork and top with tzatziki. Pop on plate with your lovely paprika and oregano mini roasties and top potatoes with a little more tzatziki. Finish everything with a little squirt of lemon.